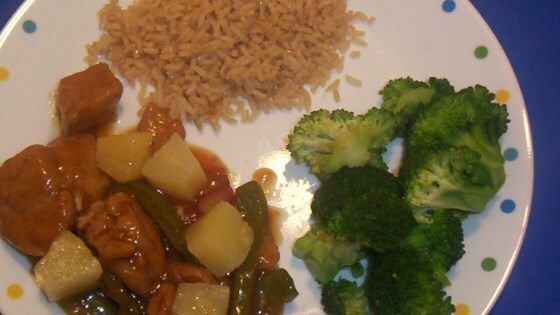 "This is a tasty vegetarian version of a Chinese classic. You won't even be able to tell it isn't chicken! Seitan is made from wheat gluten and is very high in protein and low in fat. I recommend using a chicken-style variety." We made this tonight and it was super yummy. Next time we make it, we'll probably use more vegetables, but its a keeper for sure. Maybe I just thought I liked sweet and sour dishes, because I didn't care for this at all. Quite tasty. Both my bf and I loved it. Did not turn out the same color as the one in the photo though, ours was brown. A great find. Will be making this again and again. I use fructose instead of brown sugar.